Resorcinol–formaldehyde xerogel was prepared, carbonized and activated in specific conditions to form resorcinol–formaldehyde activated carbon xerogel (RF-ACX) that was to produce microporous nanoparticles. RF-ACX was used in the adsorption of CO2, CH4, and N2 gases. 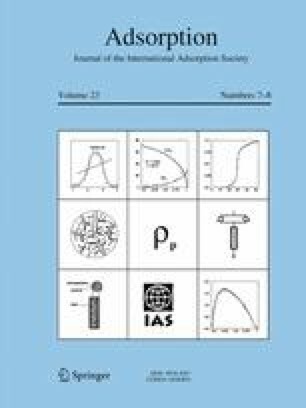 Adsorption/desorption isotherms of CO2, CH4, and N2 gases onto RF-ACX adsorbent were measured gravimetrically by a magnetic suspension microbalance at five different temperatures (20, 30, 40, 50 and 60 °C) in the pressure range of 0–1 MPa. All adsorption/desorption isotherms were found to be favorable and well correlated with dual site Langmuir’s model. The adsorption capacities of the three adsorbates increased with increasing pressure or with decreasing temperature. Nonetheless, the corresponding increase of CO2 adsorption capacity was much higher than those of CH4 and N2. The fitting parameters deduced from dual site Langmuir’s model were used to provide approximate predictions of the adsorption equilibria and selectivities of the corresponding binary mixtures (CO2/CH4, CH4/N2 and CO2/N2), which relate to separation processes of high influence to various energy and environmental applications. Ahmed Awadallah-F: On leave from the Radiation Research of Polymer Department, National Centre for Radiation Research and Technology, Atomic Energy Authority, P. O. Box 29, Nasr City, Cairo, Egypt. The online version of this article (doi: 10.1007/s10450-017-9908-z) contains supplementary material, which is available to authorized users. This publication was made possible by the NPRP awards (NPRP 08-014-2-003 and NPRP-8-001-2-001) from the Qatar National Research Fund (a member of The Qatar Foundation). H.K.-J. acknowledges a partial support from the National Science Foundation (CMMI-1561897). The statements made herein are solely the responsibility of the authors. Technical support from the Department of Chemical Engineering and the Central Laboratory Unit at Qatar University is also acknowledged.